I guess I have a little morbid streak. I have a category on Goodreads titled "death." And so yes, this is the kind of book that totally appeals to me. While I am squeamish in real-life situations that would involve anything even half as gross as what Caitlin encounters, in books I am instead fascinated. Caitlin grew up on Hawaii but moves to California after college to pursue work in the funeral industry. It's surprisingly hard to get a job, even in an economic downturn, but she does finally get hired at Westwind Crematory in San Francisco. And she had expected, she loves the work. Parts of it are very hard at first, particularly as her boss's training method is just to tell her to do things and not train her, but luckily others at the crematory are more helpful, particularly the driver who teaches her how to be appropriate when doing body removals. (You don't want to smile like you're happy about it, and you don't want to look dour or depressed. It's a fine line.) 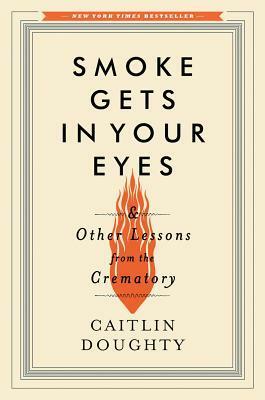 Eventually Caitlin quits the crematory to move to Los Angeles and go to mortuary school. She doesn't like that very much, especially learning how to embalm, as she's more of an all-natural girl, but she does end up at a mortuary, doing what she loves--helping people find peace and helping the dead rest in accordance with their wishes. She's quirky and different, but she's not a death-obsessed goth girl. She's respectful and just trying to do her best and help. I learned a ton of fascinating new facts including that your family can witness your cremation, even pushing the button, and that can bring great closure. She sometimes goes off on tangents, although they are well-researched, and it can at times veer from a memoir to more of a diatribe about modern death and funeral conventions and their negative impacts. But she always brings it back before getting up on too much of a soapbox. It was an easy read, relatively short, and very intriguing for anyone interested in the mortuary world. I just read a book about a teenager working in a funeral home, The Dead I Know. I was surprised that I wasn't grossed out like one would think I would be.